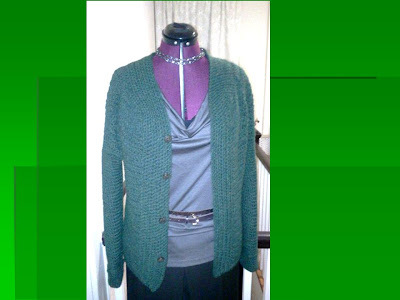 Another take on Simplicity 3634 ( Misses or Plus Size Pants, Skirt, Knit Cardigan and Tops). The first time around I went with the cowl neck, but noted that the fit of the top minus the cowl neck would make a great relaxed tee. With a skirt and boots.... it makes for a cool smart casual look. I am still on a cardigan kick... I believe this is my fourth cardigan this season. This time I used Wool-Ease in Forest Green Heather and like Lion brand stated, it has the warmth of wool and the easy care of acrylic. Initially I wore the cardigan as pictured with a solid top, thinking that wearing a printed top with the cardigan would be a bit much. However, that quickly changed when I wanted to wear the cardigan again and decided to go the way of the wind and paired it with the printed top..
End result, both garments paired with jeans worked well together and perfect for a casual Friday. I also worked this cardigan up using Premier yarn in burgundy (which I found out recently is produced by Deborah Norville)... whadaya know.... well off to make another S3634 to pair with this cardigan. Until then everyone have a Great Weekend. You make the cutest tops and cardigans! Love the looks and how they fit together. 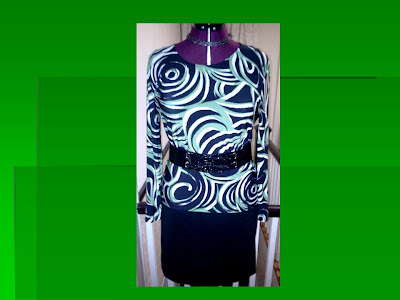 The print on the green/white/black top is cute! This very cute and comfy looking! Love the cardigans. You can't go wrong with a basic pattern and color because they go with just about everything. Great job on everything! Fantastic tops and your cardigans are beautiful. I love these cardigans. You are so fast Sheila! Love the print top and the cardigan. You have been busy with your crochet needles. I am working on another crochet project hopefully it will be done by the end of this month. I love the way you needlework fits in perfectly with your wardrobe. All of these are soooo cute! I love the tops and the cardigans to go with them. My goodness but you're quick at churning out these cardigans! They look amazing. Interesting how you make something to go specifically with one thing, then find that it works well with other things in the closet. very nice, I like this print and the other looks so obviously its a pattern worth having. I can't believe you knit those cardigans. They are simply stunning. Cute tops and your cardigans are very nice Great job! Wow! The cardigan is sweet. I love the bold print used for the top. I love cowl neck! It looks cool but comfy to wear, right? Also I really admire your knit cardigan. The shape is almost like sewn garment! You're really good! You're fabulous! I adore your cardigans. Beautiful work! I'm totally in love with green at the moment and I want your top and cardigan! I really admire your style and taste. I am loving the tops and cardigans. You are super fast! Commuting an hour and a half each way to work allows me to get a lot done in that time. 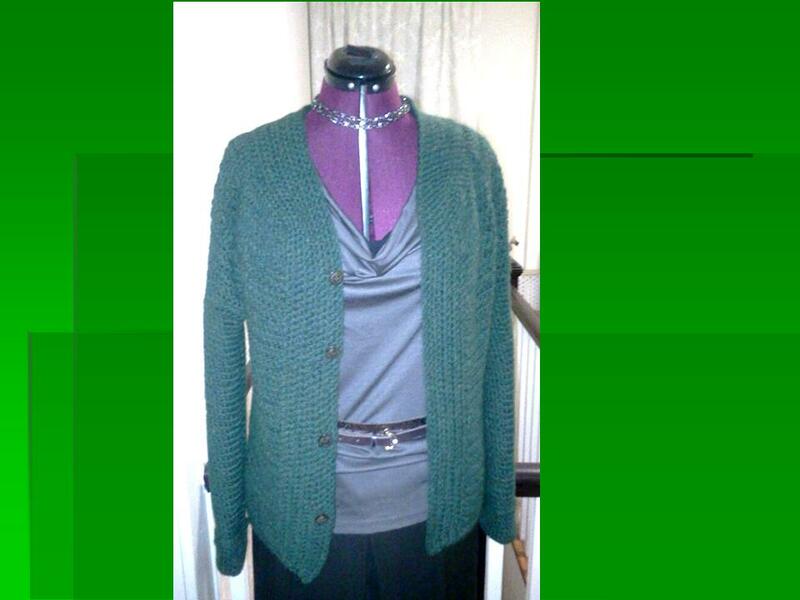 However, the burgandy cardigan was done in November and the green one in December. Matter of fact I just finished a pullover sweater this weekend which was a fast project and hope to post it soon. Great tops and cardis - you look swish!!! So nice ! All items are perfect. Here's a question though; with all of the pretty fashions, are you using more than one closet ? @ Two Cables & a Frapp: The funny thing is last year I switched from a big closet to the small closet in my sewing room (a/k/a dressing room..lol). With that I must purge at least 2x a year. I am loving your new top and cardigans. I like bolder colors so the top is great. I really like the design of the cardigans. Amazing! I love that these are basics and can be paired.. mix and match with each other! You have such a great wardrobe! Great-looking outfits, and I LOVE that knit fabric!